​A few years ago, a pile of discarded Quality Street wrappers sat on the post Christmas dinner table. A light shone through the wrappers and created a beautiful shadow effect on the wall. I thought there could be a way of creating some beautiful images using them, but had no idea how to do it or what the subject matter should be. For years after, we collected used wrappers from family, friends and neighbours until my studio was bursting. Once I had enough raw material, I toyed with various ideas until my mrs, Vic, had a brainwave. “Why not make big images of iconic sweets?” and after much experimentation, SweetArt was born. Since then, many people have contributed to making the first SweetArt exhibition possible, and have made it infinitely better than it would have been had I tried to do it alone. I especially have to thank Vic who has been absolutely brilliant in doing pretty much everything except actually making the art! I have loved making these images, which is why my ‘artist’ signature is ‘Simon’ followed by a heart. These iconic artworks feature Dolly Mixture, Fab ice lolly, Flying Saucers, Jelly Babies, Jelly Beans, Love Hearts, Liquorice Allsorts, Pink Shrimp, Quality Street chocolates (Green Triangle, Purple One, Toffee Finger, Toffee Penny and Strawberry Cream), Rocket ice lolly, Twister ice Lolly and Wine Gums, with new images being added regularly. 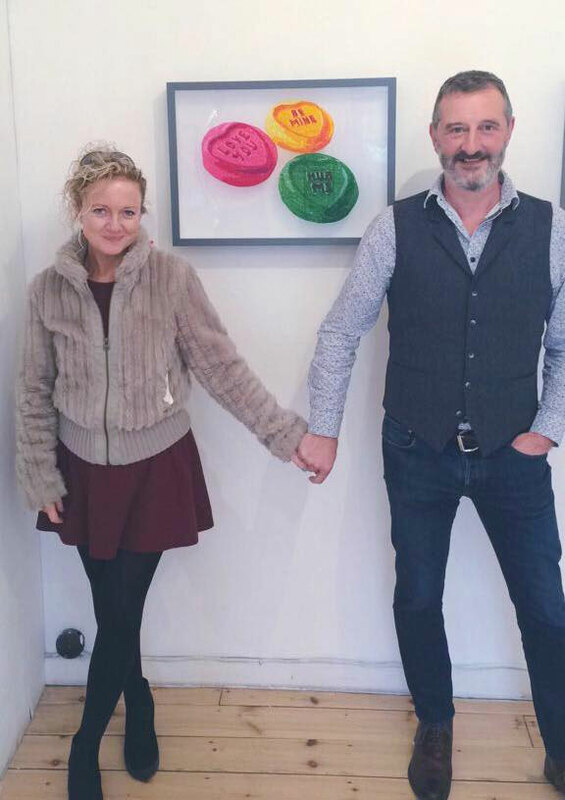 The sold out first show at Brick Lane Gallery in London ​was attended by Claire and Clive Mackintosh (original manufacturers of Quality Street) and they were amongst the first buyers. SweetArt is also Simon’s own small contribution to reducing and highlighting the amount of single use plastic going into our rivers, seas, oceans and landfill, polluting our whole environment. Simon Dry trained as a graphic designer, graduating with a BA (Hons) from Ravensbourne College of Art & Design. He has run Drydesign in London, Dublin and Suffolk, using skills learned in this time to create SweetArt along with his mrs, Vic.